Now this change is not really a big deal, and definitely makes leveling a bit easier; it also saves a little bit of money early on, and as any Hunter knows, we have one of the most expensive skill purchases at the level 40 milestone. Any money we can save early on helps to get all those skills, without having to come back later when you have the extra cash. It also means there are a lot more options starting at level 1, instead of one ranged, and one melee weapon type. 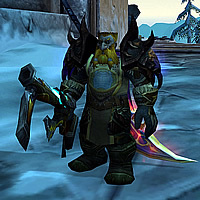 Long gone are the days of grinding mobs just to raise the weapon skill of that upgrade you just picked up, of a type you had never used before (I am a Dwarf and have pretty much exclusively used guns). I can relate, and actually had to do this very recently. It was a bit annoying, and seemed like a waste of ammo, but it’s a part of WoW that I’m used to. Something of note that some of you may remember: Intellect used to impact how fast your weapon skills leveled up. That was a long time ago, and the tooltip was removed from Intellect in Patch 2.0. In any case, it also got me thinking about the two Achievements associated with weapon skills: “Master of Arms” and “Did Somebody Order a Knuckle Sandwich?” Up to this point I really had no reason to level my other weapon skills, and I’m not really a big Achievement farmer. With the expansion removing the leveling of weapon skills, it means that these will most likely become Feats of Strength; pretty exciting indeed! As of yesterday I had 3 skills leveled to 400, and debated on which skill to level to get that fourth for the achievement. Unarmed seemed the most logical since that would knock out two at the same time. I was also in the queue for heroic Pit of Saron. The window popped up, and off I went. While I have only been back for a short while, I finally have an upgrade to my trusty True-aim Long Rifle! Thanks to the wonderful assortment of viable scopes available *rolls eyes*, I quickly crafted one up and slapped it on my new toy. Let me tell you, that was a very satisfying moment, and will definitely help in the effort to stop doing less DPS than some tanks, and get me one step closer to getting into ICC. Needless to say, this solved my dilemma of which weapon skill to level, and it wasn’t long before I would call myself Master of Arms. As with any upgrade, I switched the new item with the old item several times to see just what kind of impact it made on my paper doll stats. Overall there was a 95 damage increase on the upper damage, but more importantly, a 172 damage increase on the lower damage; a little bit more RAP by way of some extra agility as well. The only thing I lost was 1.51% crit, yikes! (I’m a Dwarf, and was using a gun). With the loss of so much crit, I don’t know how much of an upgrade this really is, but I’m sure I won’t regret making the change. If I get the chance I will grab The Diplomat (it’s a gun, did I mention I’m a Dwarf?) from Trial of the Crusader, but until then, this will have to do. A welcomed change, although I don’t like shutting out lots of players from an achievement. I’m pro equality! Update: I just pulled over 5K DPS in a regular heroic with minimal buffs. This is a first for me, and I actually got to 5300 or so. So the verdict is in, huge upgrade! I was barely breaking 4k with the TaLR. At present I’m sitting on around 300g, and when my chaarcter gets restored, I’ll be at around 3000g. I don’t think I want to spend the kind of money needed to purchase that gun. It would render a lot of haste useless since it would almost be at 1.5 before factoring any haste in. It’s a very small DPS upgrade for the cost it would incur. With the 2 piece T10 set bonus it’s not supposed to be bad, but I’m going to pass until the time comes. You need the BRK-1000 Drack. That’s where it’s at. We just need to get you in on a high caliber ToGC PuG. Hmmm… That might be tough. Well I did get a TOC10 run in this weekend and didn’t get disconnected. No diplomat, but low and behold I actually switched out from the polearm to two one-hand weapons. I also got the 245 Crusader bracers crafted. I’m approaching 4800 GS now. Probably 4900 with the 232s in the bank. Wulfers! Grats on your BlizzCon 2010 trip. Should be fun. Anyway, as far as Rowan’s is concerned… Drack’s been spending all of his G on whiskey and Iraqi whores, so he’s a little tapped at the moment. He’ll just have to get a Zod’s like everyone else and be happy with it. They don’t take gold in Iraq Garwulf. I wish I was drinking whiskey! I will be drinking soon though, woot! Honestly I really don’t want to spend the gold on that rifle regardless if I can afford it. I know it would be an overall upgrade of dps, by nature of being 70 more dps than what I currently have. I’m very peculiar about my gear, it took gar about 30 minutes of talking to get me to downgrade to keep the T8 2 piece bonus.